Has your seller ever signed back for more than the asking price while not in a multiple offer situation? This one is a classic that never fails to surprise me. An agent in my office, lets call him Robert, calls me over the weekend to vent his frustration over the actions of an agent at another firm. Here is the story; After several weeks of looking at houses, Robert’s client decides to offer on a house that has been on the market for several weeks. It is listed at $499k. The client has financing in place so Robert draws up an offer, conditional on a home inspection, for $475k. After presenting at the seller’s home, Robert waits in his car while the agent discusses the offer with her sellers. About 10 minutes later, the listing agent calls Robert to tell him that the sellers have signed back at $510k. Wait a second. You can’t do that! We all know that you can’t list a house for one price and sign it back for a higher price, right? That’s like advertising a sofa for sale at $499 and when you check out the cashier tells you it’s actually $799. It’s a little thing we in the trade like to call “false advertising”. Well, Robert calls me to share the story and we both shake our heads in astonishment. There are just so many things wrong with this story. First of all, the house has been on the market for several weeks at $499k, hasn’t anyone come to the conclusion that if it hasn’t sold by now, it is probably overpriced? Well the story gets even stranger. Robert tells the agent that he has a mind to report her to RECO and tells her that she should change the price on MLS to a higher price. The listing agent promises to make the changes if we don’t report her. You see, she tells Robert that she is new and needs to sell this house. (this is me, scratching my head in disbelief again). A few days goes by and the house is re-listed for $509k. The listing agent calls Robert and suggests to him that if he can get his client to improve his offer, she is certain she can convince her buyers to accept an offer well under $500k. With really nothing to lose, Robert gets his client to improve to $490k. he faxes the offer over to the agent and gets a sign back for $507k. Understandably the buyer has decided to move on and the listing agent is now back at square one; marketing a more expensive home that she couldn’t sell at a lower price over the last few weeks. Genius! I’m pretty sure this stuff is taught at real estate college yet I hear similar stories over and over again so what’s the problem? It’s either because agents are not being trained or mentored properly, OR, they are not explaining the rules of engagement to their clients. Either way, it is not looking good on the agents that pride themselves on professionalism. One good thing comes out of it though, I get great material to blog about. 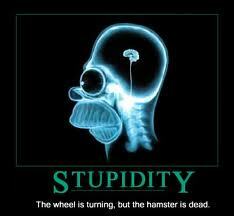 Oh, and the picture, well, I googled “stupid” and this was one of the images that came up. Classic. Wow! So everybody loses. It’ll be interesting to see how much this house sells for in the end…will the greed pay off? My money is on that it sells for less than 490K. After another 2 months on the market. It’s a classic. I will bet they won’t get close to what they want. The seller is not being represented by an agent, rather an order taker. Agreed. Probably not enough experience to take control of the situation. Is signing back over asking really a RECO violation? Can the vendor not do whatever they like?…accept, reject, or signback with any changes they want. Hi, thanks for checking in. Actually you are partly right. The seller can accept or reject, or signback and change the terms, however, he cannot signback at a price that is higher than the asking price. That is less of a RECO rule and more of a Consumer Protection rule. As I said in my blog, this is clearly false advertising. You can’t advertise a price that you know you won’t accept. Having said that, there are situations that I have personnally been involved with where a seller was expecting multiple offers on a property because he thought he priced it under value and my first offer was full asking. The listing agent said that they were expecting a higher offer price and were going to cancel the listing. My client really wanted the home so we negotiated a price higher than the list price. Saw the same thing happen when trying to buy a place with Mr Fleming. The seller was batty, and to compound things, the agent selling actually had 20 or 30 years of experience. You would think experience would help but no! Signed-back at crazy-high prices, so we walked. I was one of 3 offers last week, where the Agent was the Seller…Eva T, form Homelife//cholkan…she sent us back 3 times, over the course of 2 and a half hours to end up telling us “sorry we just did not get the price we wanted, this is very stressful” … it certainly showed a lack of respect for a fellow realtor, as well as the buyer, sitting with me in my car for 3 hours as well as the agent in the car behind me with her 2 buyers…..
That is BRUTAL. What’s the point of listing something if you aren’t prepared to accept something close? She gets 20 lashes for being greedy. Great read. Thanks Addy. Keep up the awesome work! haha wow, I’d say that I can’t believe that this happened, but sadly I can believe it! But you’re right, it gives you great blog content!